This post was sponsored by SiriusSEO on behalf of True Religion, but all thoughts and opinions are my own. Those of you that read my blog regularly will know I have a slight obsession with designer jeans. I have almost 20 pairs and always want more, not a lot considering some people have hundreds, but still a large number. Right now, True Religion is having a 25% off sale on many of their womens jeans. They have everything from ripped jeans, bootcut jeans and skinny jeans for women. I'm most partial to skinny jeans but I've created a few looks using different pairs available on their site. Look #1: First up is a fun outfit with the 'Casey Vintage Coated Dark No Flap Womens Jean' that features an ombre effect. Ombre tops, skirts and dresses have been a trend for the past few seasons so why not take it to the next level and apply it to your jeans. These are definitely a statement piece, so I've styled them to be the centerpiece of the outfit. 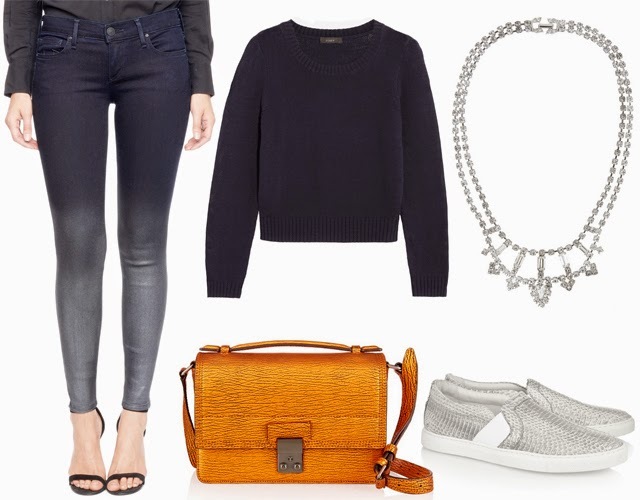 Look #2: Coated jeans are another style that I see sticking around for quite a while. They come in all different colors and styles, but I prefer skinny jeans, surprise, surprise. This style, the 'Halle Super Skinny Womens Jean' has a great worn-in feeling and is in the maroon hue that everyone has been into lately (especially me, but I've loved burgundy for years.) I paired this with a printed tank top and a leather jacket, but you could also top it off with a cute cardigan instead if double leather frightens you. When wearing jeans like this I think it's important to embrace the uniqueness and just go for it! Pretend they're just plain denim jeans and go crazy! Look #3: I promised I wouldn't just feature skinny jeans, so here we have a nice flare, my second favorite style! The 'Charlie Flare Womens Jean' is a really fun 70s style jean in a super light wash. With this style of jean it's really fun to go all out with 70s style, bold graphics or aztec designs to give off that nature-loving vibe. For this look I paired it with a pretty epic knitted coat. Since this is a long coat and the pants are wide legged, you want to be careful about proportions so I would style it with super tall heels to get the length back into your legs. A pointed toe will also help in this instance, although you will only be able to see a peek of it through the jeans. 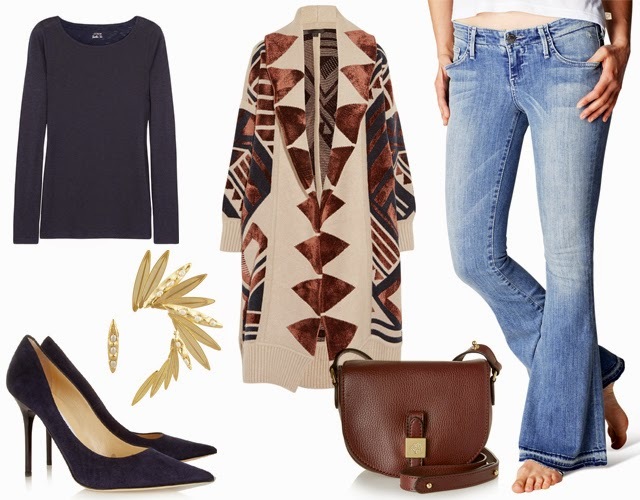 You'll also notice I broke a "rule" and paired navy with brown - but I say anything goes! You have 20 pairs of jeans? I would have never guessed that! I feel like my denim wardrobe is in constant need of an update - I have more pairs that don't really work for me than do. I think the second pair is my favorite. A color, but still dark enough to act as a neutral. Would love to add those to my closet. I'm so envious of your jean collection - and I'm dying over the top pair you pictured here. They's awesome! Loving all your picks -- especially the denim and those amazing bags! Swoon! Love the ombre jeans and I'm drooling over that sweater in the last look! I think I have about 10 pairs of jeans, but I always just gravitate to the same two pair that I rotate each week. I really like the ombre ones, it's a fun twist on a skinny jean :). Twenty pairs seem like a lot. I had about 20 pairs when I started the blog. One of the reasons I started to blog was because I wanted to remove jeans from my every day wear. Today I have about 6 pairs, that's it. Do you end up rotating all 20 into your looks? I used to have about 100 jeans but that's because I'm petite so a few pounds gained or lost will quickly change my size. Now I have much less but they are stored away and I only really use my 3 favorite pairs. LOVE True Religion Jeans... but apparently I need more jeans - I only own a handful! These outfits are awesome and I want that orange bag! True Religion jeans are awesome. I love the multi-shade pair...so cool! Those jeans are fab and the outfits you've made with them are all so gorgeous. True Religion jeans are fab!!!!! Love you're styling of all these looks! So perfect!